It seemed to me like this would be a category #2 film about a divorcee who spends her nights crying after discovering that her doe-eyed husband had gambled away their fortune with a love-able bookie. What I didn’t know is that Moneyball was written by Mr. Aaron Sorkin, the man who made a movie about Facebook that was more interesting than every movie featuring Nicholas Cage. 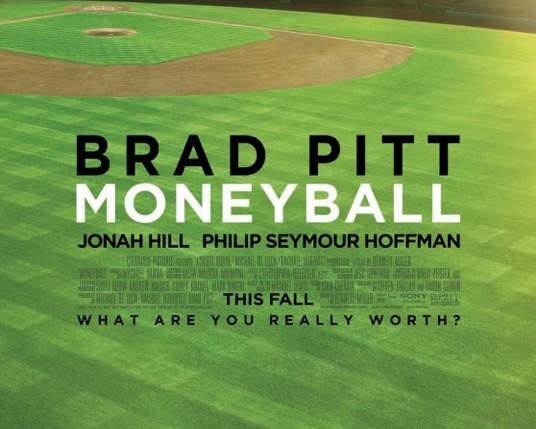 Aaron Sorkin is such a good writer that, even if you hate baseball, you’ll probably enjoy this movie about a broken-hearted man who uses math, and a nerd, to successfully create a budget-conscious baseball team of misfits. You’ll probably also be able learn a few things about leadership along the way. Plot spoilers about wins and losses will follow, but they won’t ruin your enjoyment of the movie. Because it isn’t about wins and losses. Moneyball centers around the general manager of a financially strapped baseball team, desperately trying to find a way to win games without spending a lot of money on star players. This means that he has to do things differently than 100 years of professional baseball history dictates. Not surprisingly, the angry people are the people most invested, and highly trained, in the old ways. Since the angry people work for him, he only has to give them orders that they can choose to take… or be fired. They don’t have to like his new way of doing things, they just have to do them. He just has to have thick skin. As he puts his strategies into play, he finds that they aren’t successful. His plan is sound, and while they don’t approve, his executives understand it. The problem is that his theories don’t translate to wins. Then the general manager realizes that while the “leadership level” understands the new strategy, none of the players do. They’re still trying to play baseball the old way: by hitting home-runs and striking people out. He needs them to get walked, steal bases, get hit by pitches, and wear the other team out. Which bring me to what I learned about leadership. Good leadership doesn’t stop after convincing the paid staff to buy-in to the “new way” of doing things. Those people are paid to do what they’re told. Their obedience only affects a small percentage of overall buy in. Good leadership goes the extra mile to lead the “Key Players” and volunteers into the new plan as well. It takes key players to lead the other players into following the leadership as it attempts something new. When the people you are trying to lead understand where they’re going, they tend to find success more quickly, producing more enduring results. The Moneyball results eventually show up on the field, but only after the key players buyy-in. What are you trying to accomplish? Who’s help do you need to get it done? Moneyball showed me the trailers. Moneyball showed me the reviews. Moneyball showed me the box office receipts. I didn’t see Moneyball until my wife brought it home and put it on the coffee table. Moneyball got me when they got to the key player in my life. Moneyball is rated PG-13 for two uses of the F-Word, and scenes of extreme violence against locker room equipment.